Chief Engineer Montgomery Scott, "Beam me up, Scotty!" Trick question, there isn't one! Oddly enough, one of the most frequently quoted Trek lines – "Beam me up, Scotty!" – isn't a quote at all, it's a paraphrase. 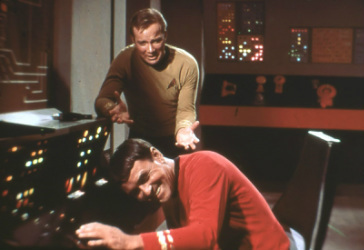 The origination of the phrase comes from "The Gamesters of Triskelion" episode during season two of the Original Series, when Captain Kirk tells Chief Engineer Montgomery Scott, "Scotty, beam us up." While there have been plenty of iterations, the actual phrase that has become an intricate part of pop culture was never used, not in that episode or in any of the "Star Trek" television shows or films.